Camping Armanello is one of the pet-friendly campsites of the Valencian Community, where you can find special facilities for them as our canine shower. But do you know how to bathe your pet? Many veterinary experts agree that it is not advisable to bathe animals, because the smell is his means of identity and communication. However, in the case of domestic pets, this process is essential to maintain hygiene at home and prevent people from getting certain infections. In addition, when dogs are at home it is more pleasant if they are clean and smell good, and especially when you’ve been on vacation for several weeks in your camper. We should follow some tips to have safety and healthy experiences. We should regularly bathe dogs, but it is not advisable to bathe them continuously as this may decrease the animal defences and the saprophytic microorganism and fat which gives hair lubrication, smoothness and prevents drying of the skin and, therefore, dandruff. It is also bad for dogs bathe them too often because moisture remains in the animal for two or three days, although they has dried carefully, increasing the chances that dogs suffer breathing difficulties in the future. The kind of skin of the animal is also a factor in determining the frequency, as the bathroom always causes a change of hair, which is more important in double hair dogs. There are animal smells that are not removed by the bathroom, but the fact we bathe them more often is not a solution to eradicate them, since it is only possible to make them disappear through medical treatment. If the dog becomes very dirty for their activity or the places he frequents, it is recommended to use some kind of dry or powder shampoo and brush them very regularly. 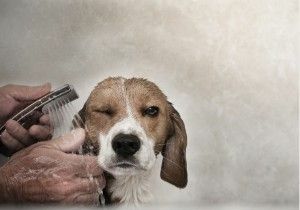 Bathing a dog is not as simple as it sounds, since it is necessary to follow some guidelines to avoid harming the animal, for example, introducing water in his ears. The first step is to take care of the water temperature and ensure it is warm. Later, you have to rub the hair well with a special shampoo that has been acquired in a veterinary center. You can also use coconut soap. We should start shampooing the back and must extend to the legs, leaving the head for the last part of the bath. Precautions should be maximized during the time we wash the head to prevent the soap entering on ears or eyes. The next step is to rinse and it is necessary to grab the dog by the snout and pour the water back and forth with some appropriate container. This is one of the most important phases of the bathroom and should do it thoroughly, because many dogs suffer from skin disorders due to the remains of shampoo or soap that their owners leave them. The dog hygiene process does not end with the bathroom, then proceed to drying. It is convenient to accustom the animal to the hair dryer from small: it is the most effective and rapid means for preventing moisture persists for too long. However, be careful that the hot air does not enter on ears. Before using the dryer, we will first dry with a towel, we caress, without rubbing, and always downward to avoid curls. Currently, there are even special dryers for dogs, who control enough noise, that most frightens these animals. To complete the whole process must proceed to comb and brush the dog. Depending on the type of animal fur, this brushing should be more or less durable and comprehensive. You think this information helpful? Here the source from which we have taken. Campers and caravanners, if you are traveling with your dogs, we wait with your pets at Camping Armanello in Benidorm!